Find inside interviews with Eleine & Rikard and fantasy designer Avalon Saez. Also, an article by The Minimalist Goth ‘Self Love’ and a review by Alan D.D. of Lacrimosa’s album Testimonium. Don’t miss the review of the webcomic Lost Nightmare, a music review of Live at Neues Gewandhaus Leipzig, by Mesh and an extensive article on Bram Stoker’s Dracula. 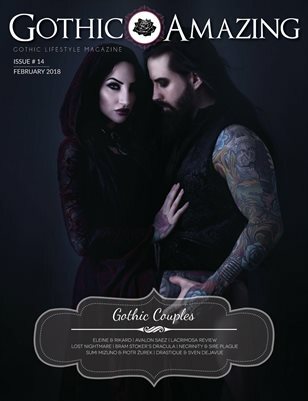 Editorials by Sumi Mizuno & Piotr Żurek, Necrinity & Sire Plague, Stephanie Winter & Helena Lush, Drastique & Sven Dejavue and The Blue Bat Girl & Killthesleeper.